You may assume that Wiltshire Council would try to preserve its Special Landscape Areas. Here is how Conservative Wiltshire Council actually wants to spoil Westbury's best landscape. Much of WC's Eastern A350 Westbury Bypass route was through our designated Special Landscape Area. As you can see here, WC's Eastern Bypass was to climb and cut the slopes of our Westbury Escarpment. You can observe on the over-view, here, how the route was on top of the Wellhead public water source. The Eastern Westbury Bypass route was little more than a kilometre from the Westbury White Horse. 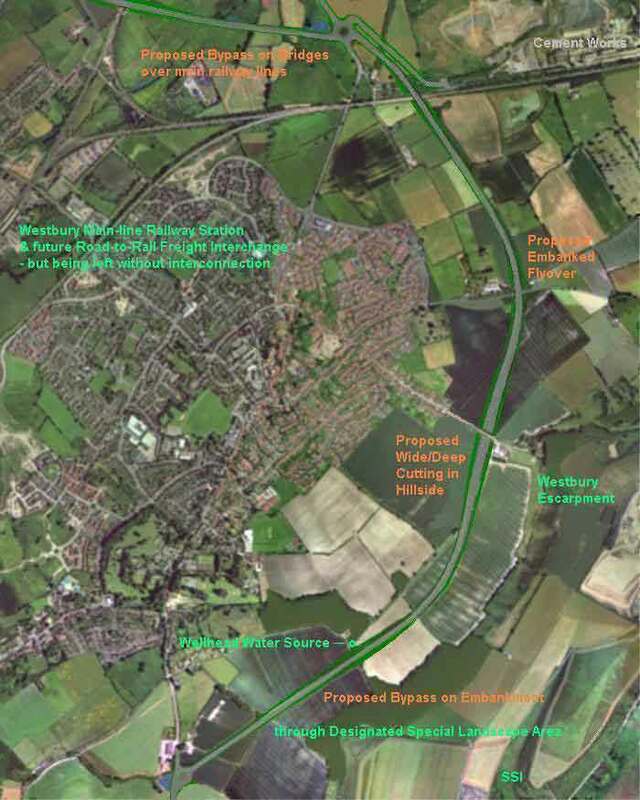 We-know-it-all Conservative Wiltshire Council's Eastern Bypass was on the wrong side of Westbury. WC's defective 2005 eastern bypass scheme was followed by a gantrified eastern route in 2007. WC's route seemed bizarre. There was an independent inquiry into WC's project in 2008. The inspector recommended against planning permission. WC's dud plan was dead. Conservative Wiltshire Council wasted � of our money on the dud project. Wiltshire County Council then changed its name to Wiltshire Council. Conservative Wiltshire Council's vanity re-branding cost us a further �5K.